Audi is making it quite a news day for itself. This time the premium brand is releasing this promotional video for the Audi A1 e-tron - a nearly all-electric variant of its compact hatch. 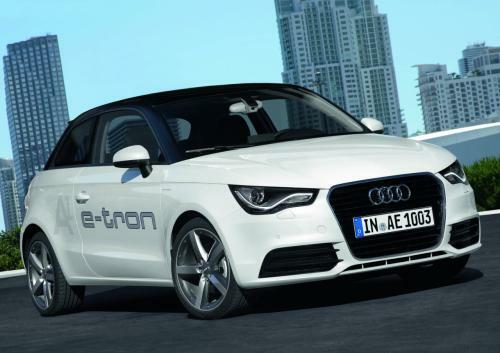 The A1 e-tron comes with an electric motor producing 75 kW (102 PS) of power (45 kW / 61 PS continuous) and 240 Nm (177 lb-ft) of torque (150 Nm / 111 lb-ft continuous) juiced by a 12 kWh lithium-ion battery pack. The range on the A1 e-tron solely in electric mode is 50 km (31 miles). A range-extending engine helps improve that number to 250 km (155 miles). That range-extender is a 15 kW single-piston rotary engine used to charge the batteries as the car is running. The emissions and fuel-economy numbers look good but they're not zero given the range-extender. Consumption on the European cycle is 1.9 liters/100 km and CO2 emissions are very low 45 g/km. Top speed is 130 km/h and the 0 to 100 km/h sprint takes 10.2 seconds. The video shows the A1 e-tron quietly cruising around town. No details on production or launch dates have been released.